Since our founding in 1993, Valuebiz has earned a reputation as the company to count on for affordable, top-quality office furniture. Headquartered in Charlotte, North Carolina, we have helped countless companies upgrade their workplaces throughout the Carolinas, in the Southeast, and nationally. We strive to accommodate businesses of all types and proudly serve a variety of different industries. There are plenty of reasons why customers from these industries choose us over other office furniture companies. For one, we have a robust inventory of new and remanufactured products, as well as manufacturer seconds that are sourced from trusted industry leaders such as Indiana, Global, and AIS – just to name a few. Typically, furniture from top companies comes with a hefty price tag. However, Valuebiz imports furniture directly from the manufacturers, cutting out the middle man and giving us access to manufacturer seconds. This allows us to offer everyday low prices on new products that cannot be matched by most other office furniture companies. And, in the rare event that they offer a lower price, we’ll do our best to match it. 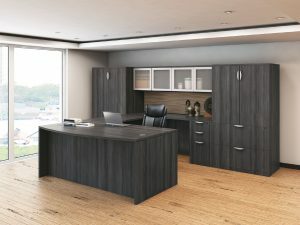 That means top-quality furniture, ranging from school desks and computer desks to workstations and filing cabinets, is available at cost-effective prices, while still maintaining the look and functionality of a branded product. We also operate on a blended sales platform, which means you can pair your new products with refurbished ones or manufacturer seconds – for example, brand-new school desks with a remanufactured teacher’s desk or new cubicles with computer desks that are manufacturer seconds. Your options are practically limitless when you turn to Valuebiz. If you are ready to upgrade the furniture at your office, school, university, federal building, industrial warehouse, or any other facility, you can get a closer look at our furniture by going to our showroom. This 25,000-square-foot facility is conveniently located in Charlotte and displays a strong base example of our products and their versatilities. Our friendly staff will be on hand to answer any questions or provide details about how our office furniture can be the perfect fit for your industry. For more information about our inventory and the various industries we serve in the Carolinas, Mid-Atlantic, and Southeast regions, contact Valuebiz today. Discover for yourself how we have earned a reputation as the dealer to count on among office furniture companies in the area. With hundreds of suppliers, we can tailor fit a solution for every application, need & use. I had a great experience with the folks at Valuebiz. They helped me with my new office space, and were both timely and fair. I especially appreciated their responsiveness and professionalism. Things look great. I would recommend them to anyone, for all their office furnishing needs, without hesitation. Pool Builders Supply has been buying from and using Value Biz for quite some time. They always go above and beyond - especially when it comes to servicing our needs. We recently needed to move some walls and desks around. Their technician, Ramon, is top notch!!! Very happy with product and service! We recently needed to get more out of the office space we have and Valuebiz did a fantastic job for us. I would recommend them to anyone who needs new of used office furniture! We have designers on staff ready to help you with your project. Please stop in, we are more than happy to begin your design. There is no appointment needed during normal business hours.